Colleen and I went down to Green Valley, Arizona for a couple of days to celebrate Christmas with two of her brothers, Bill and Bob who have a winter place down there. 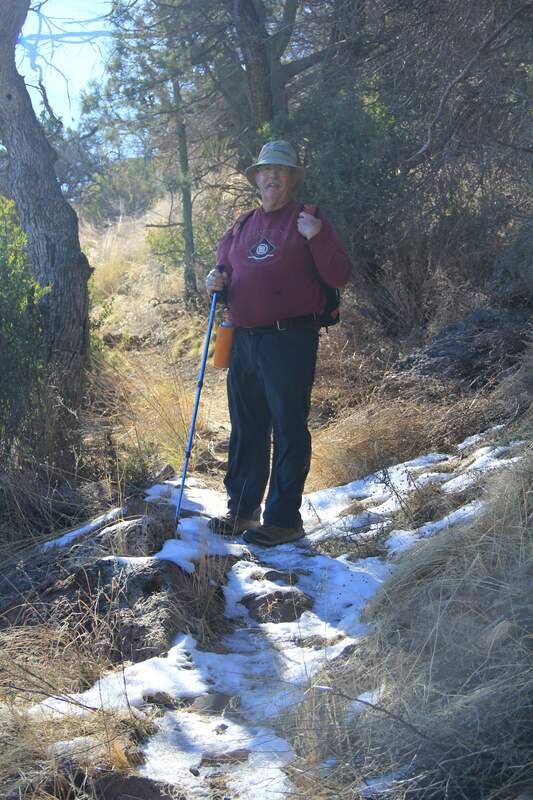 To work off some of the calories, Bill invited me on a hike on “his turf” in southern Arizona. The hike he suggested was a beauty! 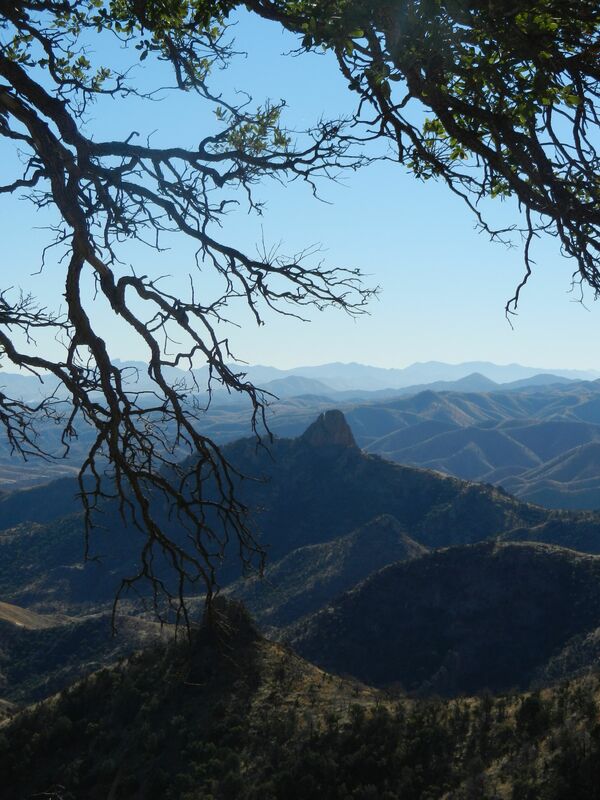 The trail, Atascosa Lookout Trail, is a five mile jaunt with 1600 feet of elevation gain, to the site of an old fire lookout station just a few miles north of the Mexican border near Nogales. In some ways this hike is similar to the Peralta Canyon hike to Fremont Saddle (distance and elevation gain), but it is really a much different experience. 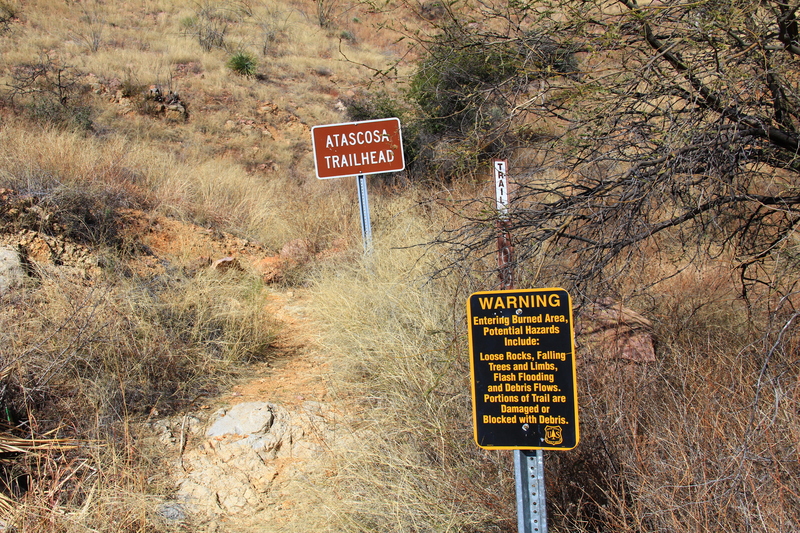 The trailhead at 4600 feet is well above the cactus line, other than a few scattered yucca, and the environment is open mountain terrain, not an enclosed canyon. 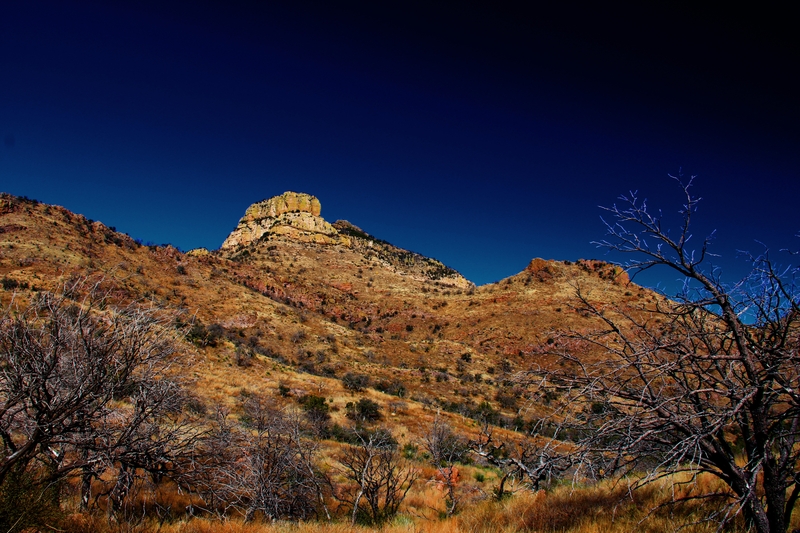 After a quick climb out from the trailhead, over a small saddle, out destination came in view. In the photo below, it is the small darker formation in top center of the photo, just to the right of the large prominent mountain at mid-screen. Below is a “zoomed” version of that scene. Our destination is the right peak with the radio towers. It is actually somewhat taller than the left mountain, but appears shorter in this perspective because it is further away. The trail was remarkably well laid out. Although it was relentlessly uphill, no portion was particularly steep. 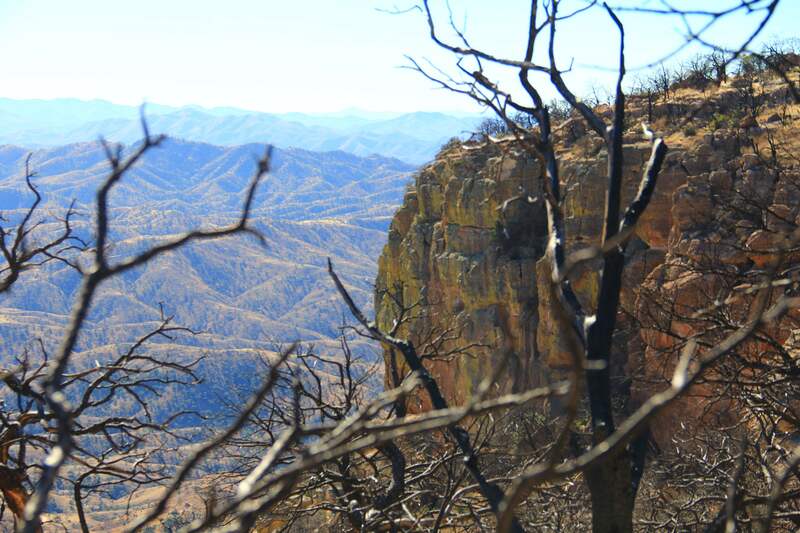 The early going consists of switchbacks in quite open country, but as you gain altitude, the trail transitions to a more forested environment. At one point there was some snow and ice on the trail. Because this is one of the higher peaks in the area (that’s why they put a lookout station there) the views were fantastic. Here is a photo that Bill took which I particularly like. Eventually you gain the summit, and the views are tremendous in every direction. 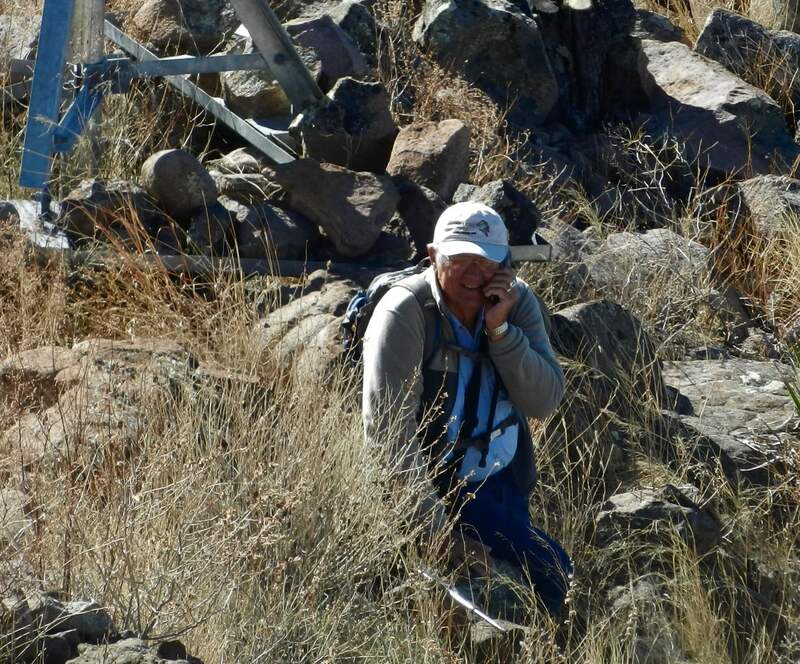 Here I am at the summit, on the phone to Colleen bragging about my accomplishment. Because of the altitude (the summit is 6200 feet) I found this a little more challenging physically than Peralta, but I have invited Bill up to do Peralta Canyon to Fremont Pass. I think he’ll see the similarities and differences. Bill took a fabulous photo of the different mountain ranges. Do the two of you also have a photo competition going???? Nice hike and great pictures, as usual – – but snow??? Thank you for sharing. We wish a Happy New Year to you and family. Fantastic views you had there. Nice. Oh my. I am so impressed at your skill in doing the hike plus the pictures are terrific. Beautiful, Hans! Thanks for sharing your adventure with all of us.